Mostyn said MSU owns the tower and uses it to broadcast KOZK Ozarks Public Television and KSMU Ozarks Public Radio. WEBSTER CO., Mo. - One worker was trapped and killed, Talburt said, and the five other workers suffered non-life-threatening injuries. "It's very lucky that we didn't have more fatalities out here," Talburt said. Andrea Mostyn, spokeswoman for Missouri State University, was at the scene of the incident. Mostyn said the university contracted with a company to perform work on the tower. She said she was not sure how long the crew had been working on the tower. “We were conducting some tower enforcement modifications to comply with some FCC changes to channels,” Mostyn said. Webster County Sheriff Roye Cole said the workers were replacing crossbeams on the tower. Cole said the first priority for sheriff’s deputies was providing first-aid to those who were injured. The sheriff’s office will perform an investigation looking for any possible criminal activity, but Cole said he doesn’t have any reason to believe something criminal occurred. Large support cables lined the private drive which leads from State Highway FF down to the tower on Thursday morning. There are what appears to be tangled metal pieces at the base of the tower, which is completely on its side. Talburt said the tower is owned by KOZK. He said he was not sure which company employed the workers. Talburt said the surviving workers were in a state of shock when first responders arrived. According to a November architectural bid document from Missouri State apparently referring to the tower that collapsed, the tower stood 1,891 feet tall. The document was apparently used to solicit bids for structural changes required for the Webster County tower, which was estimated to cost $775,000. 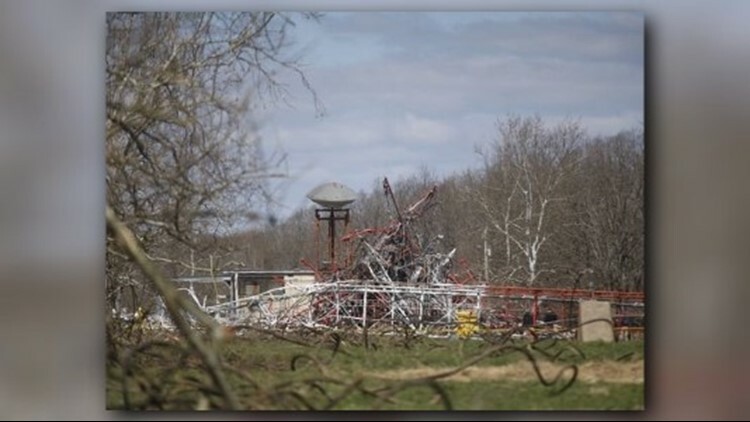 Tom Houston, general manager of Webster Electric Co-op, said there were at least five TV, weather and radio towers near Fordland. The area in Webster County has an elevation of 1,600 feet above sea level, 300 feet higher than Springfield, making it a desirable location for tower transmissions. Lee Brown lives a couple of miles away from the tower. He said he heard what sounded like a "car crash magnified by 500" when the tower went down. He said the noise lasted for a few seconds. Brown said he came to the scene to see if there was anything he could do to help but first responders had things under control. Brown said he knows people who work on the towers and the scene was tough to see with all of the mangled metal. This is a developing story. More will be added as information becomes available. Claudette Riley contributed to this report.